The XXIII Olympic Winter Games are kicking off in Pyeongchang, South Korea and the long-anticipated thaw between the two Koreas is becoming a possibility. But will the American hardline stance hinder or help the resumed Korean peace talks? We ask Chung-in Moon, special adviser to the president of South Korea for foreign affairs and national security. Sophie Shevardnadze: Chung-in Moon, special adviser to the President of South Korea for Foreign Affairs and National Security, welcome to the show. It’s really great to have you with us. Mr. Moon, North Korea will participate in the Winter Olympics and will put its team under one banner with South Korea. It’s a clear PR-move on the part of Pyongyang to show that they are good guys who can be talked to. What makes you trust Kim Jong Un? Chung-in Moon: It’s not a matter of trust, it’s a matter of trust building. Unless we have these kinds of interactions with North Korea we cannot build trust with North Korea. Therefore, we’re inviting North Korea to Pyeongchang Olympics not simply because we trust North Korea but because we want to build trust with North Korea. SS: Do you think, maybe North Korea is using the South with this Olympics business to just siphon off more money and find a loophole through the sanctions? CM: We cannot rule out that possibility. But as long as North Korea abide by non-provocative behavior and shows concrete evidence towards the denuclearization we would welcome North Korea to utilise the Pyeongchang Olympics. SS: The two Korean women's ice hockey teams will be combined - much to the disappointment of some of the South Korean team. More than 31 thousand people have signed an online petition to the president's office asking to scrap this plan. We keep saying that politics and sports shouldn’t mix. So how is it fair to deprive some players the opportunity of a lifetime for pretty much politics? CM: Yes, there’s some element of politics though. As a matter of fact, President Moon Jae-in apologised to the players of the ice hockey team that if there are any sacrifices of the part of South Korean players, he feels sorry for that one. But still, you know, we have another important aspect - that is that South and North Korean players are getting and playing together. And I think, it has some kind of symbolic as well as substantive meaning. SS: Yeah, but it also has consequences. For example, the South Korean president’s ratings have dropped sharply over the Olympics affair - is the public going to go along with Moon’s soft dialogue policy towards the North? CM: I wouldn’t say it would cause a temporary setback. I think, Moon’s popularity will come back if the Pyeongchang Olympics go well, and if the North Korean players and government authorities show proper behavior. Therefore, I wouldn’t say it will bring a definitive negative impact on President Moon Jae-in. SS: To be quite honest, I was quite surprised that the effect was dropping ratings of the President. Why do you think the South Koreans aren’t so keen on the two teams playing together, coming together under the same banner? CM: It has something to do with the North Korean behavior. North Korea has been undertaking nuclear missile provocations and North Korea has shown quite staunch in its confrontational attitude, therefore, the image of North Korea has rapidly deteriorated in South Korea. And in addition to that President Moon Jae-in made a decision to have a unified team and, also, a single united team between North and South in the area of female ice hockey team. That’s why the young generation showed unhappiness with this kind of behavior. But if the Pyeongchang Olympics prove to be successful, then, I think, that kind of setback will be overcome. SS: The U.S. - South Korean military drills that have been a thorn in Kim’s side were postponed for the Olympics. But, come on, we all know that once the Games are over the drills will resume and they include practicing the overthrow of Kim’s regime. Won’t that reverse any progress made? CM: Days in post-Pyeongchang Olympics period will be a major challenge for President Moon Jae-in. But he’s trying to work out some formula to defuse the tension and try to make use of the new momentum for peace in the wake of the Pyeongchang Olympics. It has yet to be seen. We don’t have to make prejudgements that there will be worse outcome after the Pyeongchang Olympics. SS: What is the outcome that you are actually aiming for with these two teams coming together? I mean, you said, it’s really symbolic and it’s all about grasping this opportunity to make it happen - to come together under the same banner. What is that you want from this? We all understand the reality on the ground, how things will go down after the Olympics are over… What’s your aim if we put the symbolic thing aside? CM: The mood is symbolic. President Moon has two goals with regard to the Pyeongchang Olympics.One is to make Winter Olympics peaceful, and he strongly believes that the peaceful Olympics will lead to the Olympic peace. What does the Olympic peace mean? Exchanging cooperation between North and South, trust building between North and South, and hopefully resumption of dialogue between Pyongyang and Washington and, eventually, making a major breakthrough to the North Korean nuclear stalemate. He’s now aiming at making the Pyeongchang Olympics peaceful. If that happens he’ll be trying to push for Olympic peace. SS: So what kind of cooperation would you be hoping for in the future? CM: We can engage in social, cultural and at some point economic exchange and cooperation with North Korea. NGOs would be having more interaction with North Korea. And we’re hoping that South Korea would have a dialogue with North Korea for the settlement of the North Korean nuclear issue. Those are the kind of things we have in mind. SS: Why do you think this is so important for South Korea to have this dialogue and not that important for North Korea? This is pretty much the first step North Korea has made towards coming together with South Korea. It does seem like it’s the South that’s making the most effort. Why is it more important for the South Korea? CM: South Korea wants to take a leading and more proactive role. Also, if these things go unchecked, we’ll end up with a catastrophe. And President Moon wants to avoid the catastrophic outcome on the Korean peninsula. That’s why he’s making every effort to defuse tensions and to revitalise momentum for dialogue. SS: You told CNN it was Trump’s tough talk that brought the North Koreans to open dialogue with Seoul - that there was some kind of a combination in which Trump closed the door on direct talks with the U.S., therefore the North Koreans had to turn to the South. So you think all the provocations, Twitter insults, threats to wipe North Korea off the map - all that was a part of a cunning plan to get the North and South to talk? CM: I think, President Trump has made an important contribution in which North Korea is coming to South Korea. But there are other regions thanks to which North Korea is coming to South Korea, that North Korea might want to have some kind of cooperation with South Korea. Maybe North Korea wants to drive a wedge between Seoul and Washington. But South Korea knows all those intentions of North Korea. But despite all those intentions we want to have an authentic dialogue with North Korea and come up with some kind of breakthrough in the stalemate. SS: But what I’m asking - do you feel like Trump’s contribution to bring two countries together was intentional or unintentional? Basically, was it all a big plan? CM: I don’t know. I don’t know whether it was intentional or unintentional. But the reality is this: if North Korea can have a dialogue with the U.S. directly they wouldn’t have come to South Korea. But Trump’s hardline policy on North Korea might have driven it to come to South Korea. SS: At the same time, I heard you say (in an interview to CNN back in September) that if the U.S. had spent at least one fifth of the effort it put into the Iran deal on the Korean issue, the whole problem could have been resolved. Do you think the U.S. is reluctant to bring about a plausible solution to the issue? CM: If United States pays more attention to peaceful solutions of the North Korean nuclear issue, I personally believe U.S. could come up with a solution. But I think, U.S. has been paying too much attention to the military solutions. But I hope U.S. will pay more attention to peaceful solutions to the North Korean nuclear problem. CM: This is very simple, because North Korea wants to have a dialogue with the United States. And the U.S. has been turning it down. What is the other choice for North Korea to have? It has just to come to South Korea. And we’re hoping that North Korea can have a dialogue with the United States though some kind of mediation of South Korea. SS: Obviously these talks between the two Koreas in early January have been viewed as a huge breakthrough. The last time it happened was back in 2015 and since then things were deteriorating. How do you make sure things go well this time, and won’t slide back into another blame game? CM: I’m not really optimistic about the future of inter-Korean relations. But I’ve been arguing is that we should make every effort for that to happen. It’s not really an optimistic projection. But it’s in our mandate to work with North Korea to solve the Korean problem. SS: President Moon is hoping to bring Washington and Pyongyang to the negotiating table. But we hear this ‘who’s nuclear button is bigger’ talk from Trump - and Kim Jong Un calling him a loser. If the U.S. and North Korea finally hold talks, are all those insults going to be just tossed aside, forgotten about completely, like they never happened, or will there be a mutual grudge? CM: What matters is a national interest, not leaders’ personal emotions. Therefore, if two leaders can get together they would come up with much more practical discussions on the issue of denuclearization of North Korea. Therefore, both leaders can have some kind of emotional scars in this exchange of hostile remarks but I personally believe that they will be able to overcome this kind of past by pushing for national interests as well as common interests of mankind. SS: You said South Koreans are coordinating closely with Washington, consulting before making any move. Why does South Korea need Washington’s blessing to engage in diplomacy with the North? It’s Koreans talking to Koreans - why wait for America's permission? CM: We have alliance relationship with the United States, we have American troops in South Korea, and North sees American troops in South Korea as a source of hostile intent and policy towards North Korea. Therefore, we are kind of a sandwich between North Korea and the United States. But we highly value alliance with the United States because of the very threat coming from North Korea. Therefore there’s no choice for us but to coordinate with the United States. The whole point in this, for example: North Korea claims it has nuclear weapons, we have no nuclear weapons, we have an NPT (non-proliferation) regime which would not allow us to have nuclear weapons. What us our choice but to rely on an American nuclear umbrella? SS: Does that mean that if America tells you not to talk to North Korea, now that North Korea is willing to talk to South, then you won’t talk to them? CM: No, regardless of American intention we want to have talks to North Korea. But North Korea wasn’t coming to us. North Korea was arguing that that was in their national interest to get on with the American nuclear threat. That is why they want to have talks with the United States. The United States wasn’t responding to North Korea. The United States have been arguing that unless North Korea shows very concrete steps towards denuclearization they wouldn’t have dialogue with North Korea. That is why North Korea is coming to South Korea. Of course, North Korea’s intention is that now they have nuclear weapon, they want to talk to South Korea from a position of a nuclear state. But South Korea would never accept this position because South Korean position is very clear: our goal is denuclearizing North Korea. We’re aware of North Korean nuclear weapons capability, but our goal is denuclearize North Korea. SS: Ok, speaking about the sanctions, you’ve said yourself that the current - very tough - sanctions on North Korea aren’t working, since it’s such an isolated, self-reliant society that is used to hardship. So what are the sanctions for then, what do they achieve and should they be there at all? CM: Our government’s position is very clear: sanctions and pressure are instruments to bring North Korea to dialogue, to negotiation table. Therefore, we’re not pursuing policy of sanctions for the sake of sanctions. Therefore, it’s time for North Korea to think about it very carefully. Our government’s No.1 priority is dialogue and negotiation. But North Korea has not shown any attempt to have negotiation with South Korea as well as the United States.That’s why South Korea has been joining international effort to put sanctions on North Korea. But if North Korea comes back to dialogue at the negotiation table we may loosen our sanctions on North Korea. Maybe international community can also loosen its sanctions on North Korea. Of course, North Korea should take very concrete moves towards denuclearization starting with freezing its nuclear missile activities. SS: Do you think the U.S. can decide on some kind of hostile unilateral action against North Korea without consulting Seoul first? What can Seoul do to rein in the American hawks? CM: Our president made it very clear: no more war on the Korean peninsula. No military action without prior consultation and agreement with us will be accepted. The U.S. and South Korea are allies. Allies cannot take military action and make each other suffer from immense collateral damage. Given all these things we are hoping that U.S. wouldn’t take a military action. We cannot rule out a possibility that United States will take a military action. But United States should take into account the position of South Korea. SS: The controversial missile shield THAAD has been deployed in South Korea already. Did the deployment help advance negotiations with the North or hindered progress? CM: I would say that THAAD hasn’t produced any profound impact on inter-Korean talks. THAAD has become a hot issue between China and the U.S. And South Korea is being a sandwich between them. North Korea has criticised the deployment of THAAD. But THAAD has not become any major impediment to inter-Korean talks. SS: The U.S. and South Korea are not the only ones involved in the affair. For instance, China seems to have a lot of influence over Pyongyang - what kind of help can South Korea count on from Beijing here? CM: Beijing and Seoul share common interests in making peace and stability on the Korean peninsula, in denuclearizing North Korea and fostering peaceful resolution of the nuclear issue through dialogue and negotiation. I don’t see any major difference between Beijing and Seoul on the North Korean nuclear issue. SS: Just in your personal opinion - do you feel like Beijing truly has so much influence on North Korea as everybody seems to think? Or it’s an illusion? CM: I think, it’s an illusion, yes. It is true that China has huge influence on North Korea. But China cannot influence them on the issue of regime and national security. It should be very clear. China can make a huge influence on North Korea in economic area and other areas, not with regard to regime and national security of North Korea. CM: We have several models of reunification. One is the German model in which South Korea could absorb North Korea or vice versa. Another model is the Vietnamese model when Korean reunifications comes after a major military conflict. Or there could be a consensual reunification between North and South. Our government policy is to seek a consensual reunification. Therefore, we’re hoping that South and North will sit together and try to find some peaceful ways of unifying Korea. It may take much longer time. SS: If it does happen, then when? Will we have to wait for Kim Jong Un to grow old and die before a peaceful reunification can happen? CM: We don’t know. What we can do is to promote exchange and cooperation with North Korea. We can build trust with North Korea. And we can try to aim at making free flow of people, goods and services. Without having legal reunification we cannot pursue some forms of cooperation and integration between North and South. That’s our government’s position. SS: Alright. Mr. Moon, thank you very much for this interview. 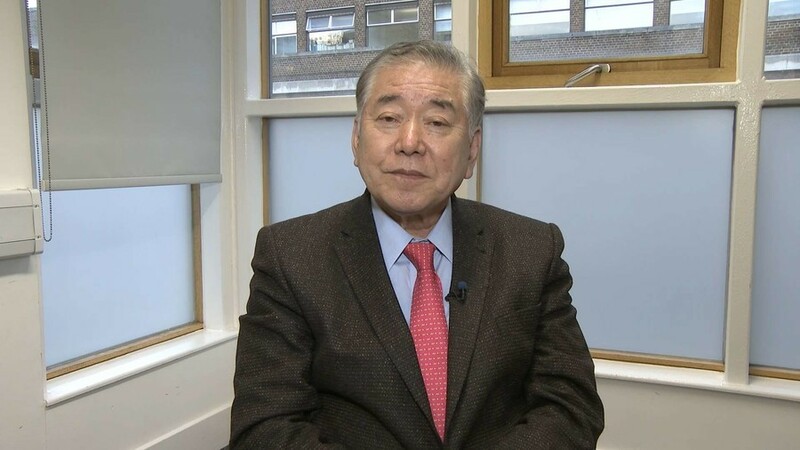 We've been talking to Chung-in Moon, special adviser to the President of South Korea for Foreign Affairs and National Security, digging into the nuclear danger that looms over the Korean peninsula. That’s it for this edition of SophieCo. I’ll see you next time.